Prism is a new project by Mozilla labs which is capable of separating web applications from the browser and running Web Apps as separate desktop applications. In other words a Web App can be run as a desktop application and not run from within a browser. Also in some cases Prism can be used even to run Web applications offline. With Prism applications run separately from the browser, so they stay up even if the browser doesn't. 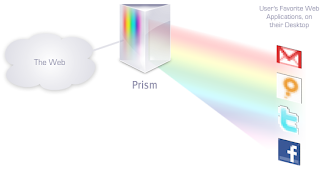 Both flavors of Prism can be downloaded from Mozilla Labs here. loos like a good thing from Mozilla. Prism is still in 1.0 Beta. So you may run into undiscovered bugs. Anyway memory usage seems ok. But it seems like script errors are there in this version.